FUTONWERK is the legitimate replacement of FORM IN FORM (forminform.de). Dietmar Wagner founded the form in form 1986 with two partners as a store, in 1988 as the form in form futon GmbH, short FiF. It quickly became the market leader in the field of quality futons. The company, which was lived and loved by its staff, the FiF team, was based on environmental, social and fair principles. We also had one of the three first websites of the furniture industry back in 1995. Among the 200 futon stores of the boom period, there were/are also a number of shops called Form in Form in Dortmund, Bochum, Essen, Duisburg, Dusseldorf, Cologne, Frankfurt, Aachen, Wuppertal Erfurt, Gelsenkirchen, Recklinghausen, Hanover, Berlin and Hamburg, which were/are, however, independent. Most of these stores no longer exist; in part because the operators regarded it as a student project and went into their trained jobs, in part because they have become conventional dealers with conventional products - such as foam mattresses since more money can be made with those products than with honest natural mattresses. Today, customers can also order a futon from Futonwerk in a bed store, which is, however, quite rare as almost all customers contact us directly. Currently we only have a showroom in Dortmund, but due to the high demand we are planning to expand. During that time, products such as the DX collection - DX FUTON – the luxury class - were created and became very popular. They are still very popular and have many loyal customers, simply because they're good. 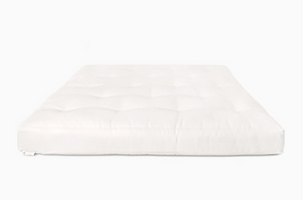 So the FUTON DX4, for example, was the clear price / performance winner in 1996 by Stiftung Warentest (Organic Mattresses) - the only reason for it not being ranked 1st and only receiving the grade "GOOD" being that the turn handles were missing (!) - a great success. Other product lines went well too, such as JAP-FUTON and the resulting, highly successful futons at / from RS-Möbel and Möbelum. RS-Möbel ("R&S Möbel"), Möbelum, YELLOW Möbel and BLUE had one of the most successful futon collections ever: the Futon LFX ("C) - similar to today's FUTON DX 4 - and the Futon LFX8 ("D") - similar to today's Biofuton DW 5.0 or FUTON DX 5. The Futon LFX and the Futon LFX8 were extremely successful, particularly in the shops in Munich, Nuremberg, Freiburg, Heidelberg, Stuttgart, Bremen and Hamburg and Munster. Seeing that futons are no longer available in these stores, all those who wish to have this level of quality again can contact FUTONWERK, because our DX 2 and DX 4 are - except for minor differences - identical. On request, we also have a genuine MÖBELUM futon / RS futon based on the old design ... of course with the 4% Old Customer Discount. There was a similar situation with the Interio group in Switzerland and Austria, whose futon supplier was FiF from 1990 to 2002. Then, Interio unfortunately said goodbye to natural products. The success had been great up to that point and many thousands of good quality futons were delivered to Switzerland, leading to a large amount of satisfied customers. Swiss looking to replace their good old Interio-Futon are, of course, also welcome to contact us. The INTERIO FUTON iFD, later futon Dxi, is equivalent to the FUTON DX 4. We drive to Switzerland regularly and the delivery to Switzerland is also free, but €89 are added for customs and VAT will be charged automatically. The FORMINFORM factory optimized futon production using self developed machines, which made it possible to produce latex futons such as DX 4 or DX 5 in large sizes (up to 200x240cm) and quantities (up to 20,000 pieces p.a.). The handiwork was not ignored but rather integrated in the form of classic factory-work, where manual skills and ancient knowledge as well as modern technology and the latest know-how are put to work effectively and humanely. This way the work becomes more of a joy and the products that result from it have a positive energy. 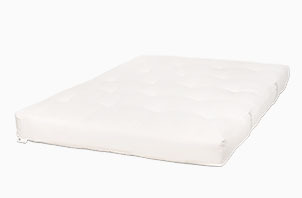 In the late 90s, the natural mattresses market went further and further away from futons to natural latex mattresses. Form in Form also shifted its focus accordingly. So it was in 1998 that the company merged with the market leader in this area, Sembella, a member of the Recticel Group (Schlaraffia, Sembella, Swissflex, Superba, ...), because the future would be in the combined strength like the founder and owner said at the time. However, he could only bear 5 years of "corporate culture" and the attempt of making a money-making machine out of a fundamentally decent and ecological product turned out to be a bad idea. At the Dortmund location a small production for futons remained active; a workshop in which the custom and small series were made that did not fit into the big factory. It is precisely this small factory where the FUTONWERK futons are made today specifically from the same fine materials / raw materials and the same loving, intelligent way as it was before. Because there is not much left of the rich culture of loving, inspiring futon stores of the 90s and most of our clients do not have a place like this within reach anymore, FUTONWERK.com had to be created in the year 2008 in order to maintain our quality standards and to continue to offer you first class futons at fair prices. And fortunately, the number of quality-conscious customers is growing significantly, which certainly goes back to the growing ecological awareness, the general increase of consciousness as well as the large amount of bad industrial mattresses which most of our customers have already had experiences with. FUTON by FUTONWERK is always of the highest quality, because it is our principle: the best quality at the best price. Our raw materials are all strictly tested for harmful substances according to the guidelines of the QUL and our products are certified by the eco-INSTITUT (Cologne). Our materials are always genuine; the natural latex from 100% unadulterated natural rubber, our cotton in large part from certified organic cultivation (certified organic) and our fleece woolin Alpine quality. We are also member of the IVN (International Association of Natural Textile Industry). Aside of the high quality standards, great service is important to us. We consult our customers according to their needs, to make them find their favorite product. In Germany, we deliver free of charge. In Holland (Netherlands), Belgium, Luxembourg and Austria we charge €35 for delivery while delivery to Switzerland requires us to charge €89 for customs clearance. In we also deliver to all other European countries, were different freight costs incur. 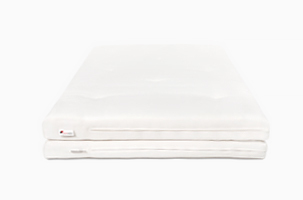 Our futons, natural mattresses and natural latex mattresses lay all across the world. Cheating / Labeling fraud is explicitly condemned by us and we point it out when something strikes us. Take care that the product you buy contains certificated 100% natural materials ... cheap futons usually contain Polyfibre-cotton, Polyester-wool, synthetic latex and horsehair with unknown contents. At FUTONWERK there is no labeling fraud; you can be sure that what is said to be in our products is actually in our products as described. We have worked with most of our raw material / material suppliers for many years which has led to relations we can rely on - though control examinations (usually by the eco-INSTITUT, Cologne) are, of course, still done on a regular basis. Since 1988 these natural mattresses have been a benchmark for quality.